The Deluxe Edition of Far Cry 3 developed by Ubisoft offers the ultimate gaming experience with exclusive missions, weapons, artwork and more! This purchase includes the key for the Uplay platform only! • The Monkey Business Pack with four new missions, new characters, and new ways to humiliate your friends in multiplayer mode! • The Lost Expeditions includes two new action missions and two guns for multiplayer! • The Warrior Pack contains an exclusive dagger and tattoo editor for multiplayer! • The Predator Pack allows you to hunt animals with M-700 Predator Rifle in single-player and use a new Predator Bow in multiplayer games! • The official soundtrack and artbook is also included in the package! 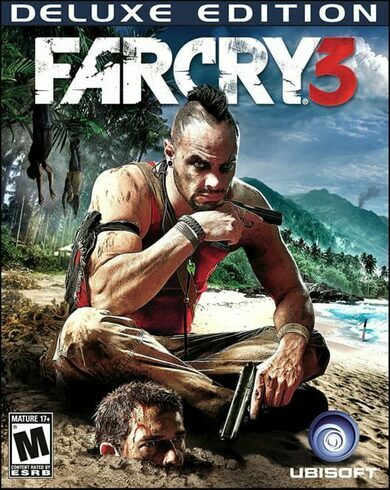 Far Cry 3 is a First-Person Shooter with some elements borrowed from role-playing genre. The game is set on a tropical island between the Indian and Pacific Oceans. The players take control of Jason Brody, who has to save his kidnapped friends after their vacation takes an unfortunate turn.